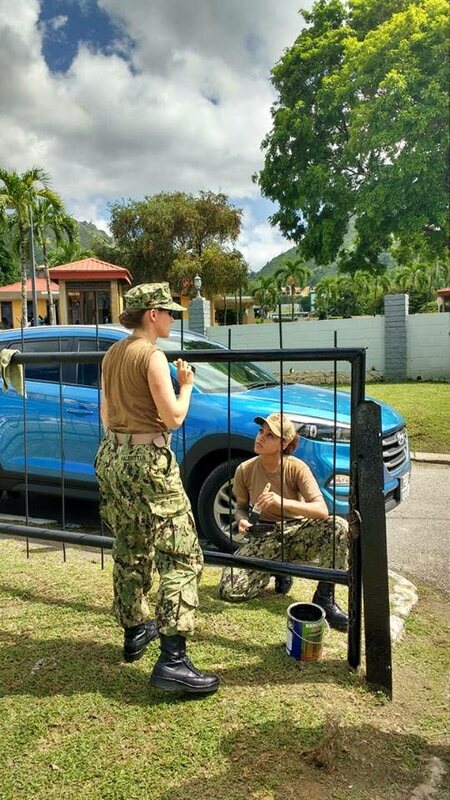 Captain of the USS Gunston Hall Commader Fiona Halbritter (left) chats with one of her personnel while painting the front gate of the Military Cemetery at Long Circular Road this morning as part of joint community relations event with the Trinidad and Tobago Defence Force. 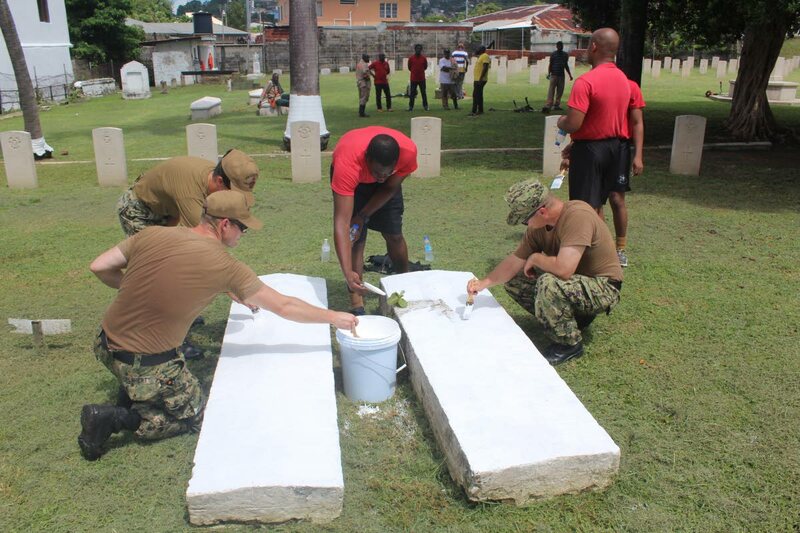 SAILORS from the visiting USS Gunston Hall paid tribute to deceased TT veterans today by helping to paint and refurbish the Military Cemetery at Long Circular Road, St James. Lt Commander Oliver Pao, navy section chief of the US military liaison office at the US Embassy, told Newsday typically when US military personnel visit different countries and different regions they conduct COMREL (community relations). "So what this does is, it gives an opportunity for them to engage with the community, usually with a partner nation. It could come in many forms. It could be playing soccer with a local community, it could be building a clinic with some engineers. You could actually be doing painting work like this. But today we're here to commemorate the veterans. So this is a tribute to the veterans – to beautify their home." "Today is for the veterans of the past," Pao added. Pao said the COMREL yesterday involved painting the tree lines, walls, all the tombstones and trim the side walks. He said it brings together partner nation forces to give them an opportunity to work together as a team and to build partnership and friendship. Trinidad and Tobago Defence Force (TTDF) in a statement said TTDF in partnership with NAVSOUTH conducted the joint community relations event and were "really appreciative" of the initiative. "This initiative highlights that despite the distance of geographic borders a common thread of military service is recognised and honoured. "The purpose of this event was to give back to all veterans who served in the armed forces of both countries." Pao said about 15 of the crew of the visiting USS Gunston Hall and 15 from TT Defence Force were involved yesterday. As part of the USS Gunston Hall visit about 12 personnel from the Fleet Health Engagement Team would be working with TT Coast Guard medical personnel and doing tactical combat casualty care, public health, and practical exercise at the end such as mass casualty scenario or humanitarian disaster relief scenario. There will also be a diving exchange between the Mobile Diving and Salvage Unit and the TT Coast Guard diving unit and will encompass underwater evidence recovery and salvage and rescue. The vessel leaves on August 11 and will return on August 22 to on load personnel for Southern Partnership Station which is a US Navy deployment focused on subject matter expert exchanges with partner nation militaries and security forces in the Caribbean, Central and South America. Reply to "US sailors help refurbish TT Military Cemetery"